These maple boards make it easy to serve up a side of pride with your favorite snacks. 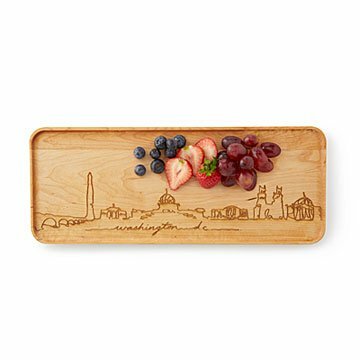 Pay tribute to the place you love most with a serving tray that toasts its unique skyline. Decorated with hand-drawn views of New York, Boston, and five other cities, these maple boards make it easy to serve up a side of hometown pride with your favorite snacks. Not into hosting? No worries. They double as catch-alls for stuff you'd usually throw on the counter, like keys, glasses, or even loose change. Talk about handy! Handmade in Vermont. Wash gently with warm, soapy water after each use. Do not soak your board in water or put in dishwasher. Towel dry your board after washing, and allow it to air dry thoroughly. Condition your board reularly with JK Adams Mineral Oil or Beeswax Wood Conditioner. Do not use board in microwave. Lifetime Guarantee, no questions asked. I bought 2 of these and love them. I'm using this product more for decorative purposes. I ordered 2, but one of them had mold so Uncommon Goods was kind enough to send me another one.